I creep on tiptoe down the hall, returning from the linen closet with a fresh towel for my evening bath. Passing Thalia’s room I hear her piping voice. From its cadence I know she is reading aloud, obviously to Teddy. If I am not mistaken, she reads The Old Woman in the Wood. I haven’t thought of that tale for a long time, and listen with my ear to the door to recall how it goes. A poor serving girl travels with her masters into the depths of a large forest, where they are set upon by robbers. Jumping from the carriage, she saves herself while all the others are murdered. Friendless and helpless, she sits under a tree and awaits her fate. A white dove appears with a golden key in its beak, telling her to open the lock on a certain tree. More keys and other trees provide the girl with all her needs. The girl lives a contented and quiet life, until the bird makes a request. The girl is to go into the hut of the Woman of the Wood. The old woman will address her, but the girl is not to answer, but rather go into the next room where there is a table piled with ornate rings. She is to find a plain band and return with it. She does as the bird instructs, and the old woman is powerless to stop her, but the girl cannot find a plain band among all the elaborate rings on the table. Catching the old woman creeping from the room carrying a bird cage, the girl gives chase, snatching away the cage. 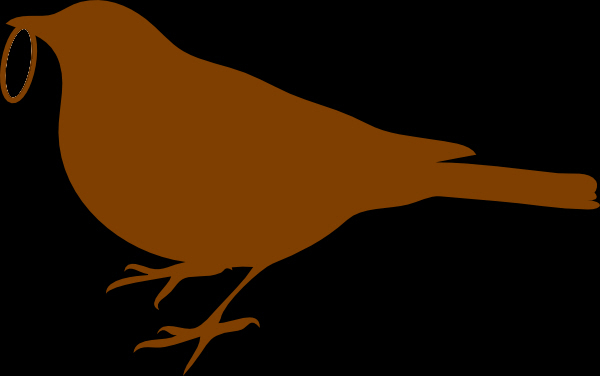 In it is a bird with a plain band in its beak. With the band, she returns to her forest bower where one of the trees wraps it limbs around her and transforms into a handsome prince. Other trees turn into the prince’s entourage. The prince explains the witch turned him and his men into trees, but that he could also be a dove. They all go off to his kingdom where the girl and the prince will be married. That can’t be Teddy, can it? On my knees, I peek through the keyhole. Framed by the aperture, there is Thalia and, in front of her, the fairy. The fairy turns her head, her black hair floating about, and peers directly at me, her eyebrow raised. Seeing myself through her eyes, I am embarrassed. 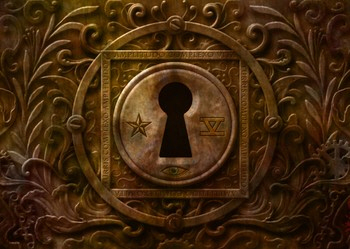 Peeking through a keyhole upon two innocents—whatever am I doing? In the bath, I put aside my shame, and let the story images return to me. What of the golden keys to the locks in the trees? Why does not speaking to the old woman deny her power over the girl? What of the table covered with rings? What is the significance of the birds? I may need to visit Augustus. The whitish smoke and rich vanilla odor of “Fairy’s Favorite” fills the air of his testing room, replete with comfy chairs, where he induces customers to try new blends. I can tell by the sparkle in his eyes I need only sit back and let him carry on. I rotate my hand to indicate he needs to explain this one. “You, of course, recall Hansel and Gretel, in which the evil stepmother casts out the children who fall under the control of the evil witch. When they destroy the evil witch, they return home to find the evil stepmother has died too. “Aren’t they a lovely combination?” Augustus re-tamps his pipe and lights it again. “A striking image,” I agree. “Although trees and keys are associated in this story, they are of two different orders. Trees are living entities. Keys are inanimate and instrumental. A key never transforms into a prince. It remains a key. Other customers enter the shop and Augustus rises to serve them. I must bide my time to ask the other questions. 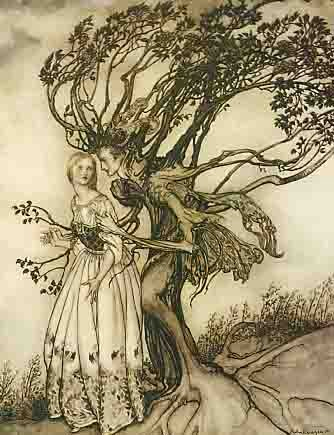 The veil of “Fairy’s Favorite” rises up around Augustus and me once again as we relight our pipes. “Rules of the game?” He is confusing me again. “Fairy tales will often telegraph the action of their story by having a ‘helper’ explain the ‘rules of the game,’ as I like to call it, to the main character. For example, in The Twelve Dancing Princesses the old woman of the wood (of that story not ours) explains to the kind old soldier how to use the magic cloak to spy on the princesses and also warns him not to drink the wine offered by the eldest princess. The listener follows the old soldier and, with satisfaction, watches him act out the advice and succeed. “In The Golden Bird the fox tells the young prince what he will see and what he must do at each of the castles they encounter. Unfortunately, the young prince is not good at playing by the rules and the listener sees the consequences, which are his continuing sorrows. Another customer comes into the store, but Augustus is too intent on pursuing his point to acknowledge him. “What do you make of the bird in the cage with the ring in its beak?” I know I only have moments before the mercantile side of Augustus’s brain takes over. “Birds are always fair game in these wonder tales. Look at some of the titles: The Raven, The Seven Ravens, The Six Swans, The Golden Bird, The Golden Goose. “The image of the bird in the cage with the plain band in its beak is haunting, asking us to read significance into it. Is this bird the soul of the prince the witch captured and by returning the ring is the girl returning the soul to the prince? “That explanation is tempting, but why then did the dove expect the ring to be on the table, hidden among other rings? “Reading into these stories a clear set of symbols—logically organized, which by understanding we lift the shroud to see the secret code underlying the tale—is in itself a fairy tale. I am sure there is more intended symbolism in not speaking to the witch, the table of rings, and the bird in the cage than Augustus is allowing. I’ll keep looking, even if it is through keyholes.